"I was watching one of those iconoclast shows on the Sundance Channel. Jamie Oliver said Paul Smith had told him something he hadn't understood until very recently: 'I'd rather be No. 2 forever than No. 1 for a while.' Just make stuff and don't agonize over it. Stop worrying about being No. 1. I see a lot of people getting paralyzed by the response to their work, the imagined result. It's like playing a Jedi mind trick on yourself, and Smith is right. That's the way I've always approached films, the way I approach everything. Just make 'em. "—Steven Soderbergh, in an interview with New York magazine. That quote sums up Steven Soderbergh's film career—which he claims will end after the release of his Side Effects, opening this Friday—better than I'd necessarily like it to. Soderbergh's career has been so consistently excellent for so long that you can't help but be a little disappointed by it, and that line goes a long way toward explaining why. That's to say: That is an extremely logical, rational, and sane way for any person to look at his or her career—whatever the field; I'd say it's not a terrible way of describing how I've tried to go about my own, for example—but I'm not necessarily sure I want my film directors thinking it. There is something inherently limiting about it, something humble and smart and good yet seemingly wrong in a way that probably isn't fair but is there anyway. I await Soderbergh's movies like few other filmmakers', and every time they're over, I'm comforted and grateful to have been in the hands of a master filmmaker ... but I'm never quite satisfied either. You admire Soderbergh films, but you never run out of the theater with your heart pounding, wanting to slam through a wall. They don't leave you cold. But they don't get you boiling either. This is a matter of taste, I grant you, and I'd rather see a Soderbergh film than some huge swing for the fences by a lesser filmmaker who can't pull it off. That said: If he's really done, I wish he'd swung for the fences more. The closest he came was probably Che, which is still experimental and cerebral and weird in its Soderberghian way. (And it's worth noting that it's the film that Soderbergh wishes he had never made. "Literally I'd wake up and think, 'At least I'm not doing that today,'" he's said.) He takes on such a wide variety of projects, for such a wide variety of reasons, that finding a through-line in his career other than "eclectic intelligence" is difficult, if not impossible. There's an element of self-protection to some of his choices; sometimes they're so strange and different and forcefully odd that it's as if Soderbergh were covering his flank, knowing that you can't fall that far if you don't promise too much. In his best films—Out of Sight, The Limey, The Girlfriend Experience, The Informant!, Ocean's 11—you see Soderbergh putting his own spin on something familiar. (The Girlfriend Experience might be the exception there; It feels like a film only Soderbergh could make.) They're thrilling movies, but they still feel self-contained; they feel like they're happening in a closed place, with Soderbergh holding the lid on. I say that with admiration. Like Grierson, he's my kind of filmmaker, an unpretentious, work-a-day sort who just goes about his business, doing his own thing his own way. I just can't help but wish he'd get a little more pretentious once or twice. Pretentiousness occasionally gives you high-wire-act failures like Oliver Stone's Alexander. But sometimes it also gives you JFK. Do I like Soderbergh's career more than Oliver Stone's? Of course. I can't think of a single Soderbergh movie I actively disliked. (Maybe Full Frontal.) But I like JFK more than I like any Soderbergh movie. Soderbergh has always seemed to direct from a defensive crouch. You can see this a lot with Side Effects, which is expertly made and smart and unconventional and still distancing and frustrating. It's a movie you'll enjoy more the less you know about it, something that's true of all movies but particularly so with this one. Suffice it to say, it goes in all sorts of wild directions, but because Soderbergh has his hand on the tiller, it never hurtles out of control. It's a crazy thriller that never feels all that crazy. I enjoyed it, and I certainly admired it, but I never felt stirred by it. It's a fitting one for Soderbergh to go out on, if he's really going out on it. (And I don't believe for a second he's done.) You're relieved the movie is so smartly put together, but still feeling a little left out of the fun. Soderbergh responded to this exact criticism in the New York interview. "I would argue that some of the things I've done that frustrated people upon a first viewing, ten or fifteen years later you're happy that they're that way," he said. " I remember describing making movies as a form of seduction and that people should look at it as though they're being approached at a bar. My whole thing is, when somebody comes up to you at a bar, what behavior is appealing to you? And there are certain things that I'm not willing to do to get a reaction." He's right, of course, and it's unfair to make a case against his logic, which is pretty airtight. But still: I dunno; I kind of like reacting to movies sometimes. Sometimes, I would have liked it if Soderbergh had put his intelligence and good sense aside and just done something crazy, just to see if it worked. It might not have. It might have made him look like a fool. But it would have been worth a try. I would have love to have seen Soderbergh embrace his inner soap opera once or twice. This is why, ultimately, I find myself gravitating toward Quentin Tarantino more than Soderbergh. Is Soderbergh a smarter, more disciplined filmmaker? God yes. But Tarantino is willing to look insane in service of his own vision. Django Unchained might be my least favorite Tarantino movie, but I love that he just went for it, full hog. When you're willing to take crazy risks, sometimes you fail, and sometimes they all pay off, and you get Inglourious Basterds. Soderbergh never made an Inglourious Basterds. This is all nitpicking: Soderbergh is one of my favorite directors, and I'm deeply sad to see him "retiring." But then again: Being sad about what is being withheld is one of Soderbergh's trademarks. 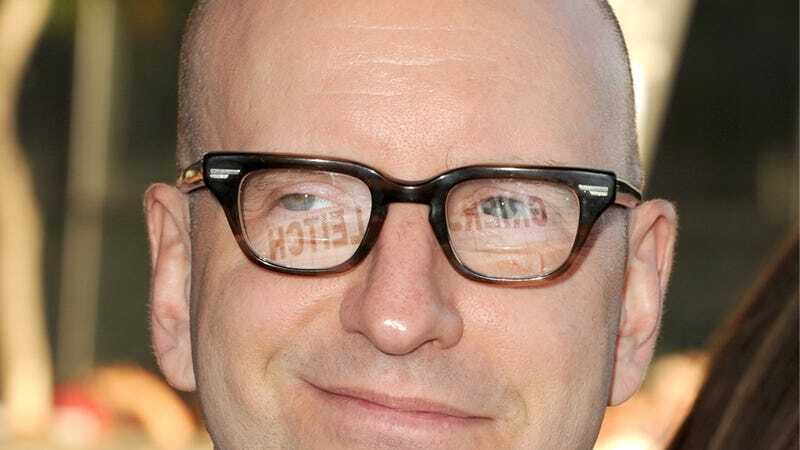 I admire Soderbergh as a filmmaker more than almost any other. I just wish he went a little more batshit, when he felt like it. If he's really gone, my brain will miss him more than my heart will.